If you have tall trees or woody shrubs, chances are you will benefit from a pole saw. Wind and snow damage often break tree branches, causing them to hang onto wires, gutters or even over your car. All trees eventually develop a dead limb. Left to itself, the dead limb will snap, potentially breaking a window, damaging lawn furniture or even hitting someone in the head! Continue reading to learn why you need a pole saw. We’ve even created this guide featuring the best pole saws for 2017. Why Do I Need a Pole Saw? Gardeners have been planting and caring for trees for thousands of years. We’ve learned that our trees need pruning to keep them in shape, remove dead or diseased branches and to cut away damage caused by wind or snow. Pruning also stimulates flowering and fruit production. But trimming tall trees has always been a challenge. Ladders allow you to get closer to the branch but the working position is often too far away for safe cutting. This can lead to dangerous leaning and or standing too high on the ladder. Many gardeners have lost their balance, fallen off the ladder and ended up in the hospital. You’ll never see professional arborists hanging precariously from a ladder. The other problem, even if you have a safe pruning position, is getting the saw blade where it needs to be to cut the away the branch. Traditional crosscut saws and bow saws are too large to fit in between the limbs. Sawing becomes awkward or impossible! Fortunately gardeners and professional horticulturists have tested, experimented and perfected one of the most useful gardening tools ever. The pole saw! What’s a pole saw? Combine a small, sharp blade that cuts through wood like butter with a long handle that reaches into the tallest tree and you’ve got a pole saw. 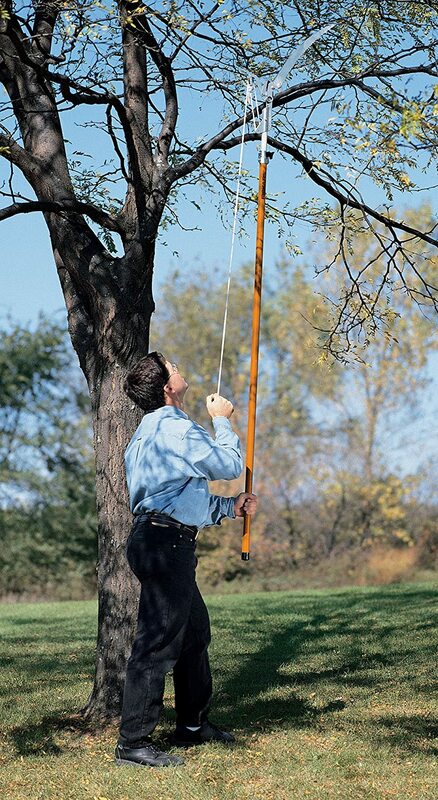 The pole saw allows you to stand on the ground and trim the tree safely. No need for a wobbly ladder, chain saw, or broken leg due to a fall. Pole saws come in a variety of lengths. The typical range is 8 to 20 feet. The best pole saws are made of lightweight materials for easy handling. In the past pole saw handles were made of heavy wood. Today’s pole saws are constructed of aluminum or fiberglass composite. The best pole saws are one piece tools that extend out from the handle. Friction clamps secure the extensions in place. Saw blades are replaceable incase the original becomes dull. Some of the best pole saws also have a pruning blade for snipping small branches that don’t require a saw. Simply position the pruner on the branch and pull the rope. The rope causes the pruner blade to cut the branch. Fiskars is a name you can trust with gardening tools. 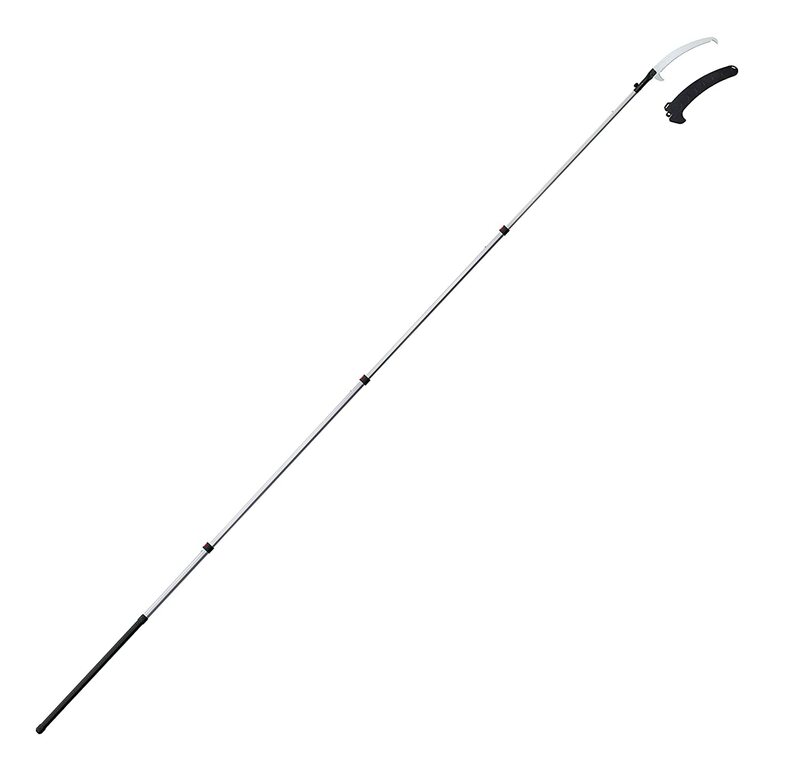 The extendable pole is made of lightweight but very strong fiberglass composite material. This will reduce back strain and fatigue when working in taller trees. The precision 15-inch saw blade easily cuts through thick branches. The pruner head will snip off branches up to 1 inch thick. The lifetime warranty provides peace of mind. 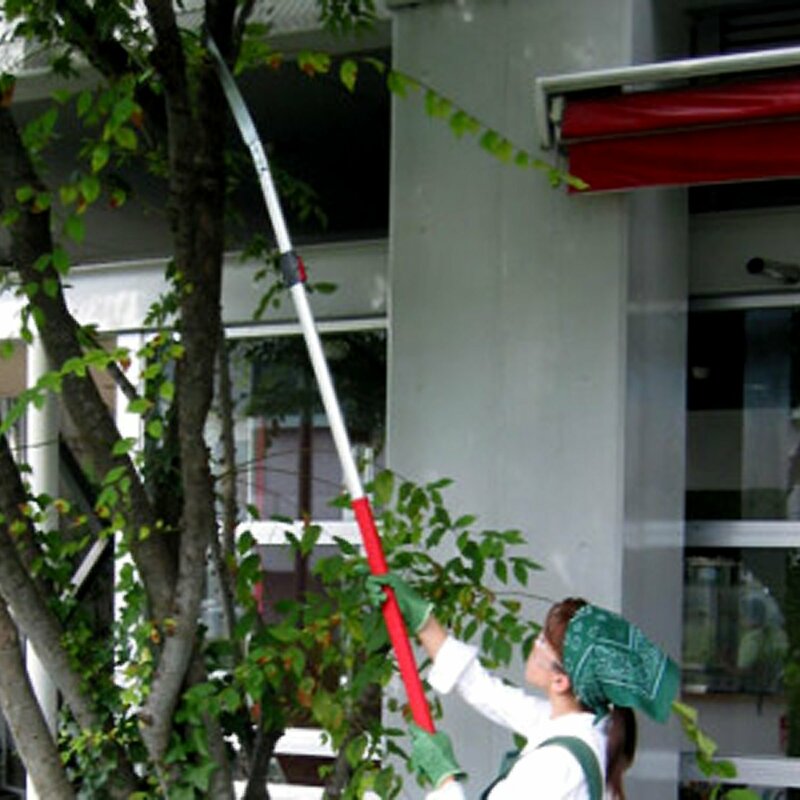 The Japanese-made ARS telescoping pole saw has a range of 6 to 9 feet making it great for smaller tree trimming. It weighs in at only about 2.3 pounds! This basic pole saw comes with a tri-edge straight blade for precision trimming. Perfect for light-duty tree work. If you have flowering trees this will be the best pole saw for keeping the growth under control and the flowers blooming every spring. The Hayauchi 390 is the best pole saw when you need to reach tall branches. The 21-foot working length will go where other pole saws can’t. Japanese-quality insures a long service life. The oval-shaped aluminum allow poles provide strength and reduces flexing, especially when the pole is fully extended. A plastic blade case is included. Comes with a lifetime warranty! The Fiskars 14-foot pole saw could be the best pole saw for most gardeners. It combines a Teflon-coated saw blade and a powerful pruner head. The 14-foot length will give enough reach for most home pruning work. The sturdy fiberglass pole is lightweight yet strong. The pruning head gives you the option of pruning smaller branches high up in the tree. Many gardeners like the combination of reach and weight of this dual-action pole saw. Gilmore is a brand every gardener trusts. This pole saw comes with three 6-foot extensions for a maximum working length of 18 feet. The poles are constructed of strong fiberglass. The cast aluminum saw head will not rust. The saw head features a hook to grab and pull loose branches out of the tree. This pole saw requires some drilling and assembly. This is a professional-grade tool and is the best pole saw when you have a lot of tree work on a continual basis. Also, here is our detailed article on the best cordless hedge trimmers.